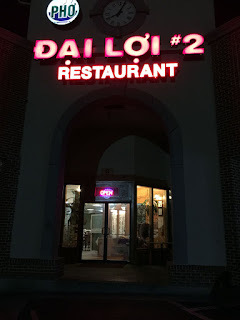 This location of Pho Dai Loi #2 (I know of at least two and there are apparently 3) is located at 4186 Buford Hwy Ste G, Atlanta GA 30345 between Plaza Fiesta and the crossroads of Plaster and Dresden Rds (heading South on BufHy you cross over Dresden and Plaster and it will be on your right in a small shopping center that's a bit hard to see; alternatively if your traveling North it will be on your left right after you pass Plaza Fiesta (as an aside, Plaza Fiesta recently made the list of one of the best Latino malls in the US - just an FYI that you may want to check it out if it's been a while since you've visited). 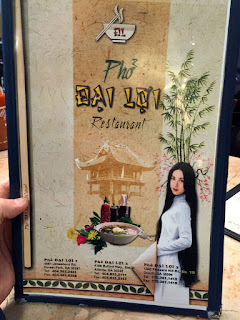 We've eaten here several times, ever since our favorite Pho #1 closed as an alternative to our other standby, Pho Bac (which closes really early for some reason - I do love their Pho Ga). 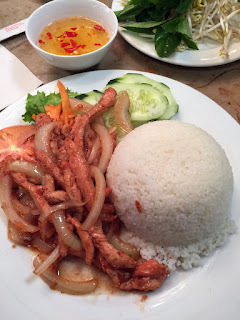 As usual the service was very good and the ambiance genial to dining and conversation. We arrived about 8:30 (4 of us as my neighbors John and Jules offered to drive) and the place was about half-full of tables - mostly Asian but a scattering of local Anglos. I really don't care for the parking lot in this small shopping center (Saigon Square I believe?) - it was packed and we parked at the extremes. Where are all the people anyway, at MTV Cafe? 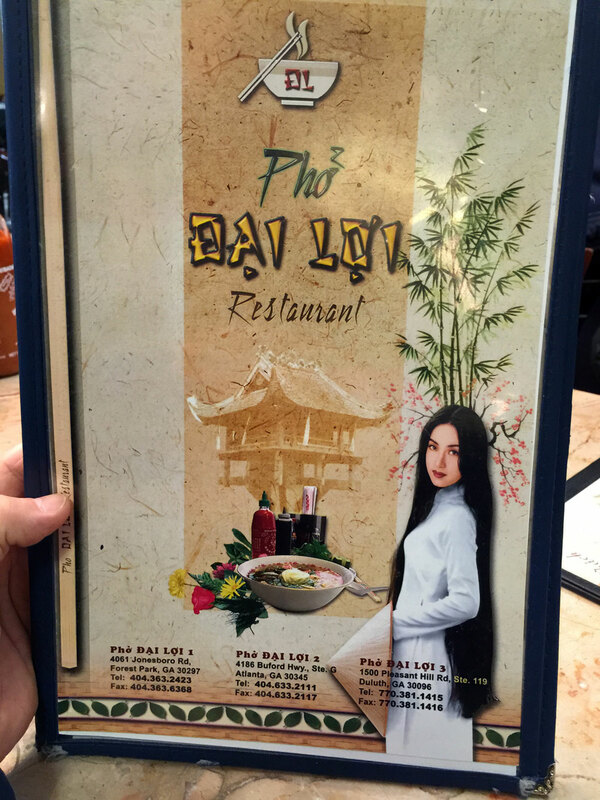 They certainly weren't all at Pho Dai Loi. The menu is quite extensive with many options - it's also quite beautiful with decorative elements you don't commonly see on menus that made it quite unusual. 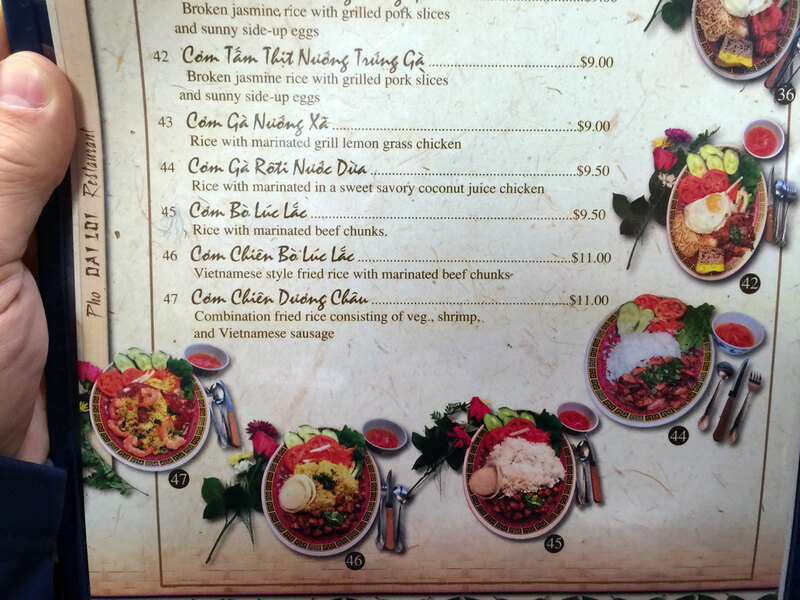 We each ordered a different dish - from pho to bun to co'm. I've had their pho and decided to get something different - the "chicken cooked in coconut juice" sounded good but was a little off for my tastes - I probably won't order it again. Everyone left with huge grins and bellys. The star of this meal was the goi cuon (shrimp and pork rolls) - besides being large and beautiful (the orange contrast of the shrimp fairly glowed against the greens of the veggies), the skin was the thinner type I favor and the abundance of herbs was delightful, as was the dipping sauce (tasted homemade instead of the gluey slop you usually get at other pho restaurants). I'll be ordering these again. Price for the X-Large pho was $7 - the medium was ordered by dining partner Jules and was quite large enough to satisfy her. Prices overall were quite reasonable. 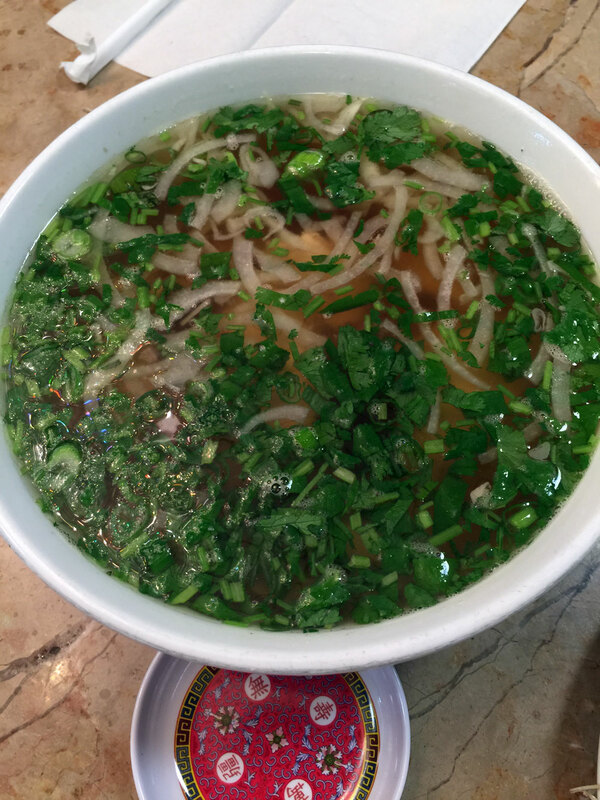 The "salad" provided with the pho was extremely fresh - something I always look at when dining in similar restaurants. I do wish they had alcohol, but the water-with-lime was refreshing. The only negative (and we noticed this the last time we ate here) is that near closing the staff starts moping the floor with some piney disinfectant - I appreciate the cleanliness but when you're trying to eat the odor can be both overwhelming and off-putting. Several comments were made about it from the group and we ultimately left due to the smell (but maybe that was the point as we were all well finished by that time). A quibble but I thought it worth mentioning.